A stunning, large limited edition book, signed by 36 Battle Of Britain fighter ace pilots -The last of "The Few", and many WWII heroes. . Many of the pilots who signed this print, were awarded the DFC (Distinguished Flying Cross). 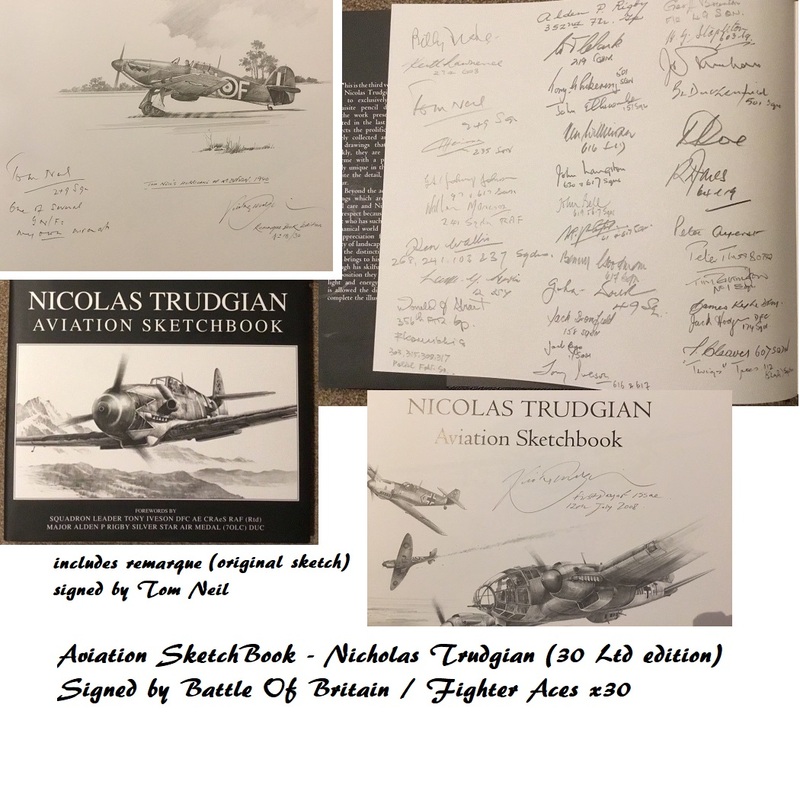 Nick Trudgians Aviation Sketchbook Remarque Edition No.18 of 30 copies. The Remarque is of Battle of Britain ace Tom Neil’s Hawker Hurricane based at North Weald. Tom then kindly signed the drawing and wrote: "One of several GN/Fs, my own aircraft." Drawing also signed by Nick stating No:18/30 of Remarque Book Edition. Also signed by Nick stating first day of issue 12 July 2008 on following page. Tony Iveson has signed his contribution on the forward page. The page opposite the Remarque drawing is signed by 36 veterans including Battle of Britain, Dambusters/617 squadron, American Aces, Polish vets, Bomber Command, Desert Air Force. The book has been kept out of light and is in excellent condition throughout, with lovely clear signatures. Comes with original signing COA from Vector Fine Art prints. Ken Wallis BC, ( flew 28 bomber missions over Germany). Autogyro pioneer. Luke G Lewis (12 3SY) ? Tony Iveson B of B and 617 sqn. J Cleaves 607 SQN ? The book was released at Duxford Flying Legends 2008. Signed on same day at Vector Fine Arts, Aces High marquee and CCB Aviation marquee. Further signatures were obtained at the Shoreham Aviation museum in Kent, UK.